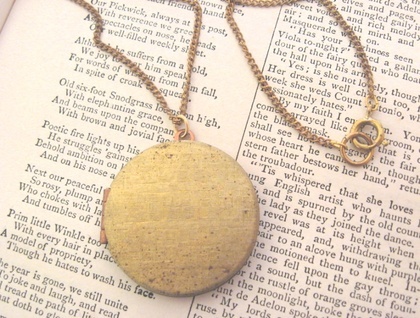 This vintage locket is made of raw brass, with copper fittings inside, and has a finely textured chequerboard or basketweave pattern on both sides. It hangs, via a vintage brass jump ring, from a fine, brass, opera-length chain from the 1950's. The entire piece has aged to a rich gold colour, but is still quite bright. 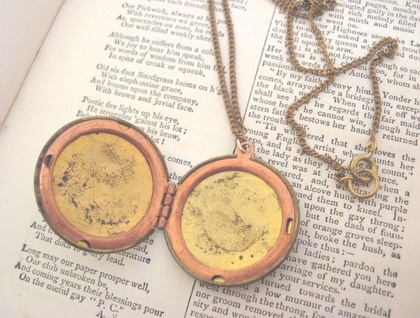 The locket sports tiny rust marks inside and out - see the photographs - as a testament to its age. It opens and closes smoothly and easily. This simple piece has a real Olde Worlde ambience. The locket measures 30mm, not including the baile, and the chain measures 94.8cm - long enough to be worn wrapped two or three times around the neck, if desired.